CS GO ranks are really awesome and force us to play! We want to rank up so hard and it is so much fun to talk about the ranks and make fun of friends who have a low rank! xD Getting better is a really good feeling and trying to get a better rank is hard work and can be frustrating sometimes. Make a Comment: What is your Real Rank? The matchmaking system in the Counter-Strike Global Offensive competitive mode, rates your skill through CS GO ranks! In total there are 18 different CS GO ranks and skill groups. How does the CS GO Ranks work? How does CS GO Ranks work? If you start with a new account, you need to reach level two (Valve is changing this from time to time). You can level up by playing the basic CS GO modes: “Casual, Deathmatch, Demolition or Arms Race”. 2. How can I get a CS GO rank? To get your CS GO rank you have to win 10 ranked games in the matchmaking mode. In these games at the start there is a huge gap between skill levels, but after a few games Valve will define your skill tier and the balance is getting better. After you’ve played 10 games the CS GO Matchmaking system assigns the suitable CS GO rank. Info: Valve defined a maximum of 2 wins per day, this means you need at least 5 days to reach the 10 wins and get a skill group. Read more about the CS GO Matchmaking here. 3. What is the CS GO rank for? The CS GO rank is also called CS GO Elo (value to define skill via different algorithms). The reason for this is to play fair games with equal teams, these teams should be on the same level. Playing a good match in these balanced games, making kills and finally wining the game, leads to a higher cs go rank! Your performance inside the game will be rewarded with a derank, uprank or you will stay on the same level. 4. Where can I see my CS GO rank? 5. Where can I see the rank of other players? 6. With which other ranks do I get queued? Every player is queued with players of the same group or near this group, the maximum distance is plus & minus 5 ranks to the players rank. If the CS GO ranks of friends are too far apart, it is not possible to play with each other, because the skill balance would be too crazy & broken. 7. What are CS GO levels for? Beside the rank, every player can level up his account to get rewarded for his success. The CS GO levels range from 1 to 40, they have impact on the item drops that you can get after a completed match. When reaching a level, players can earn CS GO medals for their profile. 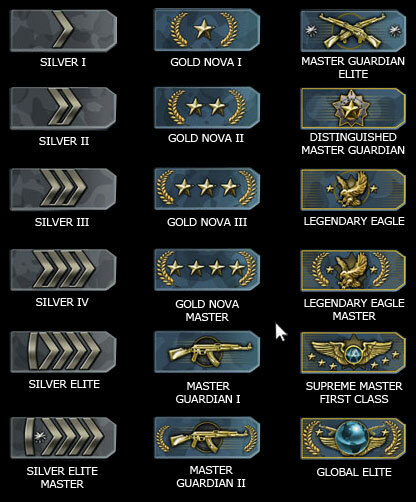 There are 18 CS GO Ranks, which are defined in three rows. These are the skill groups or “tiers” in Counterstrike Global Elite. Players define themselves about their rank and their tier! How many players are Silver? How many players have which CS GO rank? Ranks show the skill level of a player in CS GO, and yes they do a good job and show the actual skill level compared to others quite accurate. About 32% of all CS GO players have a silver rank. 35% of all players have a Nova rank. If you are an upper Nova, you are already better than average! This means about 66% are ranked in Silver & Nova, only 33% are higher! A quite big part of 20% are skilled players who are ranked as MGs and DMGs. Only 13% of all players are Legendary Eagle or higher! This is a really small amount. Finally less than 1% are ranked as Global Elite! This shows how hard it is to reach Supreme & Global Elite! 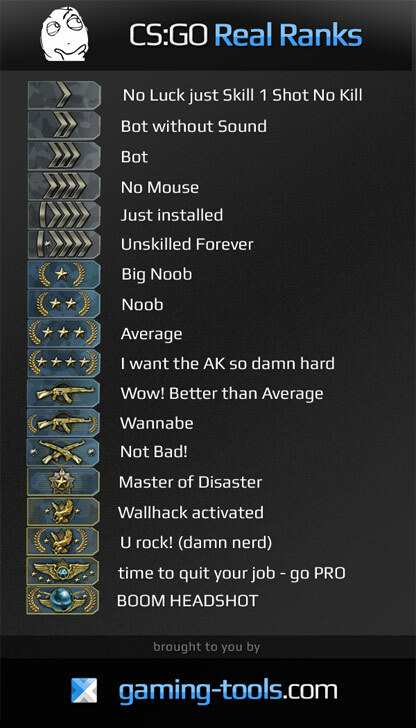 What does a rank tells you about a CS GO player? What is the main difference between the ranks? The Novas make the most part of the players in the game with over 30%. Nova players are quite skilled and have either a good basic knowledge in all areas or a performance that is above the ordinary in one characteristic for example aiming, strategy or communication. But not more, Nova players are often stuck on their level and need to learn more techniques and mainly need to keep the focus in a ranked match to reach the next level. Master Guardian players are coordinated and advanced. MGs and DMGs combine tactical knowledge with aiming and spraying skills. The most conditions can be reached through train, guides and hard work! With our guides you will be MG in no time. Only an exremely small amount are natural born pros who did not much for their rank. The Eagles, Supremes and Globals are the high class of Counterstrike Global Offensive. These players have outstanding skills when it comes to aiming and they just feel the game. The most of these guys put a lot of effort into the game, which leads to the knowledge about buying trends and good movement behaviour. They learn how to move on the maps, how to use the weapons perfectly and use self created crosshair and game settings. Some reaction skills can be trained, but it is good if you are fast & young to enter this level more easily. After Valve’s balancing patch for Counterstrike Global Offensive, nearly all players dropped down. This was a custom adjustment to fix the balancing, with the main reason of too many new players and accounts. After a while the system got more and more directly high ranked players and most of the players had a high Nova rank or even a Master Guardian rank – and exactly these people are now ranked as Silver Elite Master or Nova 1. Imagine how many players raged about this issue to be ranked down so far. The shitstorm and madness finally ended in acceptance in the scene, because the changes really made the game better & ranks mean more now! Many players feel bad to not belong to the MGs or DMGs anymore, but now beeing MG is something you can rely on! How to rank up in CS GO? But let’s check this in detail: There are a lot of factors that can affect the CS GO ranking. These factors are kills, deaths, the kda, assists, won rounds, mvp stars, bomb plants and defuses, shooting accuracy, headshots, teamkills and suicides, the round lenght, the damage given and taken, the scoreboard position and grenade & knife kills! This is a lot! But which factors are the most important? 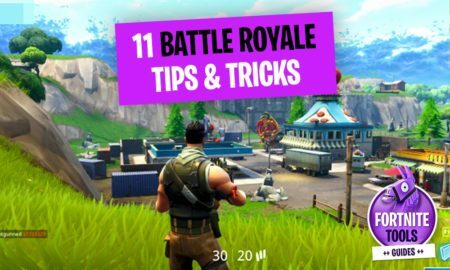 The first step that helps, is to try to just win the games with a good amount of the difference between the rounds (16-0 is better than 16-14). But the other factors can be also important on the long-term and prevent you from deranking! Only play a ranked CS GO match if you feel fresh & able to focus your mind into a 45 minute game. Avoid ranked matches if you are tired or unmotivated. It helps to improve and upgrade your computer and hardware. Some guys play with a wooden pc and historical headsets and a mouse, where you can be happy that it has 2 buttons. xD With an awesome monitor with a superfast refresh rate of 2-4ms things are more easy! The perfect mouse, a mechanical keyboard and a good headset will setup things in a way that will make the ground for your career in CS GO and the rank group that you will be in! For all who are new to CS GO, the beginner guide is a good read. A good strategy to rank up in CS GO is to play with people who follow the same goal and play mainly for the uprank! What is your player role in CS GO? Avoid playing solo, because this increases the chance of trolls, teamkillers, afk guys and all people who want to make you lose the game. Play with as much friends as you can, up to 5 players. This improves the gameplay and shows, which players rule the game and which are just ballast that you need to carry. Choose wisely, with which friends it is worth to play. Kick the dead freight out if possible and just play with the rulers on your level. 😉 Then ranking up is a guarantee! How to find more CS GO mates: Talk to people in the game and add them as a friend if they are good players. In addition to that use clan sites and community servers to find other gamers who search the same! no luck just skill , 1 shot no kill ! lol, derank 5 times in the passed month.